Unless you knew, you wouldn’t believe this is in Scotland would you? What some know as the Road to the Isles, the A830, runs from Fort William to Mallaig in the west, taking in spectacular views and notable sites such as Glenfinnan, where Bonnie Prince Charlie raised the standards of rebellion in 1745. From Arisaig, a fine, relatively new, section of highway speeds essential traffic north-south, whilst the older road between Arisaig and Morar, now the B8008, offers a more leisurely – and beautiful – alternative. Taking this route means you don’t need to worry quite as much about the traffic; but it is a significant challenge keeping your eyes away from the scenery as you negotiate a road that twists and turns and includes frequent narrow, single-track, stretches. We were directed by good friends P&A, who know it well – and that helped a lot. However, the coast here really is unforgettable – and that’s what we’ve come for; rock-framed unspoilt sandy beaches, with views to the Small Isles of Muck, Eigg and Rum and, possibly, Skye to the north. 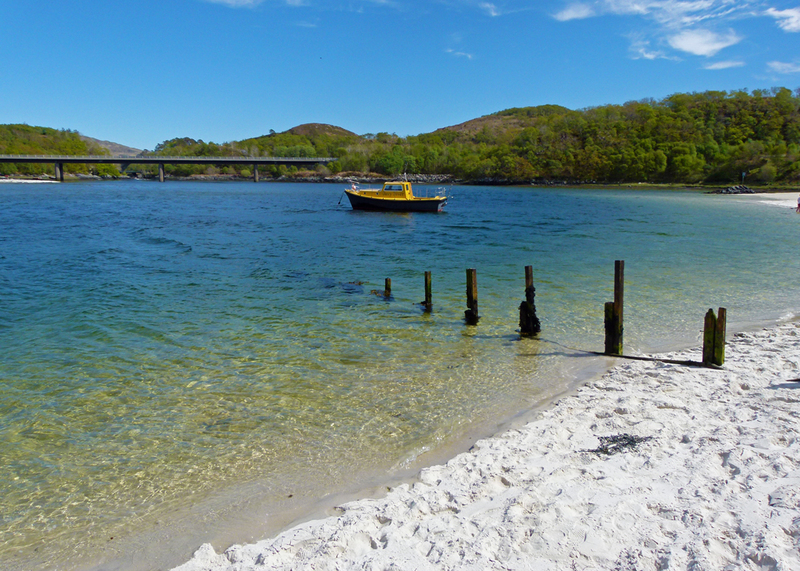 These are the Silver Sands of Morar – some say the White Sands of Morar. On a good day, the sea is turquoise; you could be in a tropical paradise, couldn’t you? – provided you don’t actually get into the sea. I suggest you also take a coat in case it’s windy. Morar is also a village, and a loch, the deepest freshwater lake in Britain, where Nessie’s cousin, Morag, lives. Travelling north, you’ll spot the silver (or white) sands just beyond the village of Back of Keppoch. At Portnaluchaig the road skirts the beach and then continues past a golf course at Traigh. Beyond Camusdarach, where there is an area of dunes, the road then follows the beaches of the Morar estuary back to join the A830. 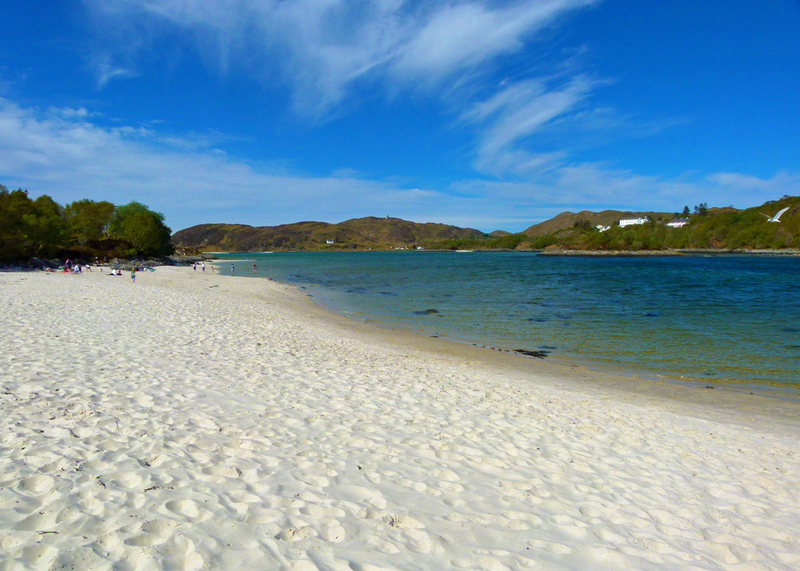 The Silver Sands of Morar should be on your itinerary when you visit Scotland. And take your trunks; despite the chilly waters, people were bathing when we visited. A word of warning – this area is popular – especially with campers and walkers. There are car parks, but space is limited, and the narrow roadside gets congested. But persevere. If you can’t make it to the Silver Sands of Morar just now, you might care to watch the 1983 film, Local Hero, again, starring Burt Lancaster, Denis Lawson, Fulton Mackay and Peter Riegert. 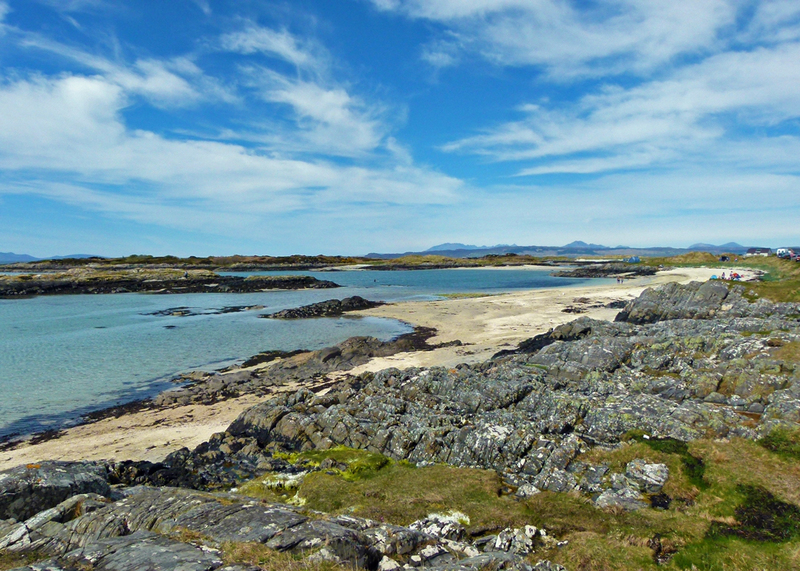 Because the beach scenes were filmed at the Silver Sands of Morar. Or maybe it was the White Sands. I’ll leave you with Going Home, the theme from Local Hero, written and performed by Mark Knopfler. Personally, I think the live versions are better, but this clip comes with some lovely scenery. A beautiful corner of Scotland that we’ve never seen. Must put it on the list for next time. And a beautiful piece of music too! we will definitely make the trip to see this area when we are there in September. Great! 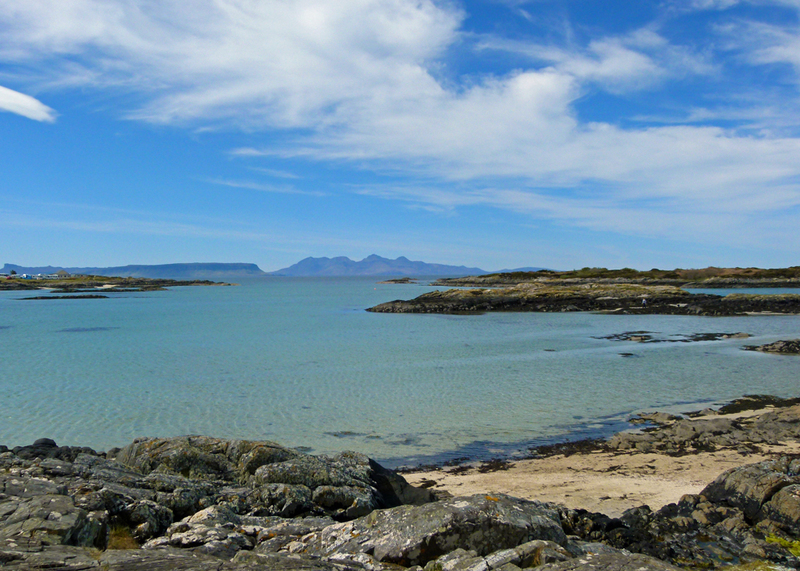 Make a point of popping into Arisaig – it’s beautiful and there’s a fascinating little museum there. And you can’t miss Glenfinnan. Both on the directory and, as promised, I’ll be adding more to that before you go. I aim to do more features on Scotland soon, too. Fabulous to see these photographs, what amazing sands. Great video too, thank you. Those sand look fabulous 🙂 Apart from one occasion the weather has always been favourable when I have visited Scotland. When the weather’s good, Scotland is stunning. It’s a gamble..! The coast looks stunning! I think it’s easier to make it look like Paradise when you don’t dip a toe in the water… Scotland is growing on me, I think I need to visit someday! I’m convinced Scotland would be better for it, Magali! Mark Knopfler is one of our favorites, great scenery in this video. I’m glad your ‘to visit’ list is growing – that’s the whole idea! Well, partly. Lovely post with some fabulous photos – and for me, a nice trip down Memory Lane. I visited this area in the summer holidays of 1967! (I was between lower and upper sixth at the time). I haven’t been back since and your post has made me want to do so. Those sands are beautifully white and, as you say, it’s hard to believe it’s Scotland. When I was up there, there were few of the tourist issues you mention and the beach was very quiet, especially for August. This is gorgeous, Mike. What a fabulous blue sky and the beach is stunning. I never would have imagined. gorgeous, but it’s cold for swimming? Beautiful! I have been pestering my husband to have a holiday in Scotland for years; we nearly booked it this year but he changed his mind and we are off to Switzerland in a few weeks. Very nice but I still want to go to Scotland. Local Hero is one of my favourite films, maybe my most favourite. We were very pleased to find out that our next-door neighbour was in charge of costumes for the film. Thanks for a wonderful post with gorgeous photos and for the clip. Really nice photos Mike. Sunshine and blue skies/water makes all the difference there as I’ve seen it in dull weather and it’s not the same. Kayaked around that coastline and in Loch Morar years ago before it got busy and well known. Nice set of islands both off the coast and in the loch itself. What a beautiful landscape this is! You’re rights, it doesn’t look like Scotland, but then Gretna Green is as far as we’ve ever been in Scotland. This does not look like the Scotland I have read about, but lovely never the less. This looks like an amazing place to visit, with the exception of too many tourists. I prefer cold water actually as I like to stay on the beach, and so if it’s freezing, the people I’m travelling with won’t be bothering me for a swim. Wonderful scenery in that video too. Beaches, puffins, heather, mountains…Just magical!! I’ll try to forget that the water is probably just above freezing temperature. I’ll make sure Mr. C sees this. The Back of Keppoch Is our favourite part of the Scottish Highlands, the sea is so clear, the little bays are just great, we know a wonderful caravan site here, we have had so many wonderful family holidays here My husband and I went back 2 years ago and it is still just as magical a place as ever. Yes, the sea can be cold, but so worth swimming in clean sea. The only tiny thing to worry about are the midges, but if you sit/walk near the edge of the sea, they are not quite so bad. I would love to go back for another holiday before we are too old to do the long drive.